20 August 2010, at 9:44a.m. BRAZIL - Novogen is pleased to announce that it has reached agreement with Globoaves for the distribution of the Novogen Brown and Novogen White in Brazil. Globoaves operates through the newly created company, Novogen Avicultura Ltda, with its headquarters in Cascavel (PR) and branch offices in Birigüi (SP) and Itirapina (SP). This gives Novogen a very good opportunity to establish a major presence in Brazil, which is the largest egg market in South America. Olivier Behaghel, director Brazilian operations Groupe Grimaud, explained: "This new partnership between Globoaves and Novogen, a company of Groupe Grimaud, is the natural outcome of the already existing close collaboration since 2009, when Globoaves and Grimaud created a new company called 'Global Breeders' for the production and distribution of broiler breeders for the coloured/alternative markets." Roberto Kaefer, partner and commercial director of Globoaves, commented: "Novogen offers a new alternative to the egg producers, providing them with more options and possibilities to answer to their specific needs, taking into account several criteria to achieve well-balanced products for the different segments of the market. That is the reason why we have decided to invest in Novogen and to become a partner. We will take our responsibilities to make this a great success. On the other hand this gives us more consistency and commercial power in the layer breeding industry." As business partner of Novogen, Globoaves will provide support in the infrastructure of farms, hatcheries, logistics, technical and commercial service. Mickaël Le Helloco, General Manager of Novogen SAS, added: "We are very satisfied about this close collaboration with one of the largest and most dynamic day-old-chick suppliers in South America. We are convinced that the Novogen products will express a high level of performance in Brazil, which will also perfectly fit to other countries in Latin America." Novogen Avicultura Ltda has appointed Leomar Klassman, who has extensive experience in the production of eggs and day-old chicks, for the sales in Brazil. He will be supported by Sérgio Bia Candia, who has been working for several years in Brazil and also South America in the commercial layer businness. 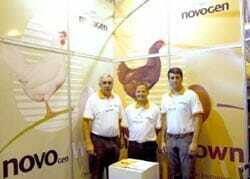 During July, 2010 the NOVOgen White and NOVOgen Brown products were introduced at the 51st traditional Egg Show in Bastos (SP). This region produces about 14 million table eggs per day, which is about 15 per cent of the total production in Brazil.